A young man, fresh out of mortuary school and ready to take over the world, walks into a mortuary convention for the first time. He makes his way to the floor of the show. He is dressed to impressed- new suit, nice shoes, freshly cut hair. He certainly looks the part of a young funeral director. But things change drastically when he begins his first attempt at networking. He meets a more established funeral director and finds himself face to face with an extended hand and a smile that could light the entire convention center up. The young man awkwardly extends a limp “fish hand” out for a shake and sheepishly turns his eyes to the tops of his shiny new dress shoes. This is his big chance to make an impression on someone who could be pivotal in helping him succeed in the field, and his lack of interpersonal communication skills is about to hurt that first impression. Mentors in this field are looking for confidence, eye contact, poise and effective verbal skills when they are assessing the skill set of someone that is trying to break into the industry. Opportunities like this are few and far between, and you can’t let one pass you by without taking advantage of it. Immediately, our young friend’s first opportunity to make a connection is missed, and he is quickly tossed aside by the elder, more experienced director in favor of another opportunity to meet a new face at the conference. The young man learns quickly that there is more to the mortuary business than books, science, and logistics. The most important element for success in the funeral business, whether you are working with families as a director or with funeral homes as a service or equipment provider, is interpersonal communication. You must network to make it in this business. No matter what your role is in the mortuary field, you deal with people—and it is going to be face to face. The new generation of recent mortuary school graduates relies heavily on digital communication. While email and social media are important tools in today’s market, the mortuary business still relies on personal relationships built through true conversation. Most funeral homes are family-owned and passed down through generations. So how do you break through? It can be intimidating, but we have some tips that just might help you build the relationships you need for success. Attendance numbers are dwindling at these events as younger generations forego face to face contact for conversations on keyboards. Never underestimate the importance of the relationships that are built not only on the floor of these events but also at the social networking opportunities that occur outside of scheduled activities. Some of the strongest relationships are built over lunch or a cocktail. 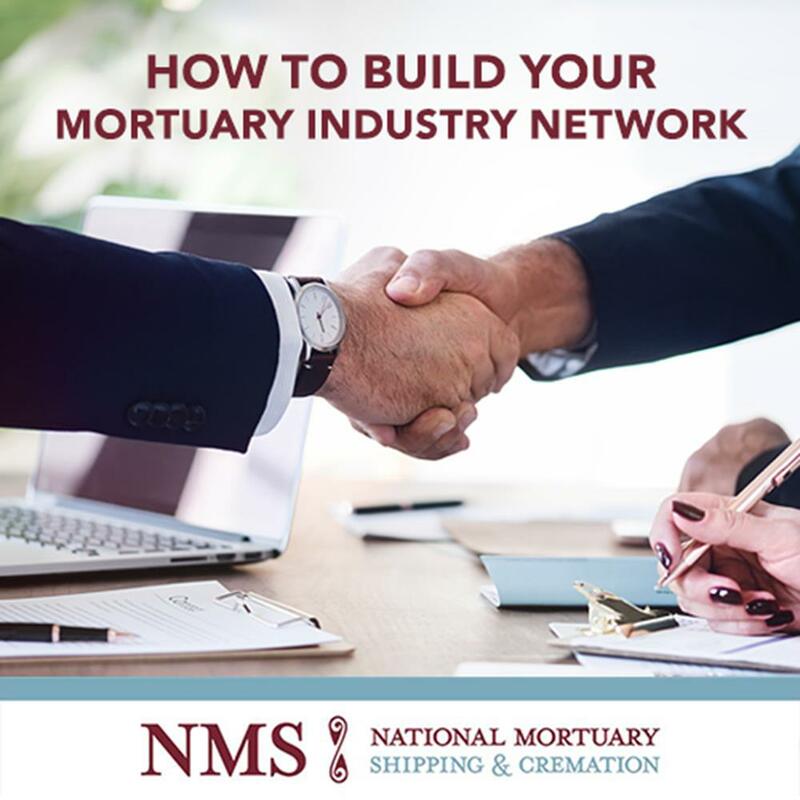 Some of the strongest network connections were forged over conversations that had nothing to do with the mortuary industry at all. Friendships turn into business relationships, and those are the ones that last. It’s not only about the networking, however. These conventions are the places where the product leaders in your industry are going to display their newest technology and innovation. You need to know your industry to have conversations with those who are immersed in it every day. Soak it in. Learn as much as you can to strengthen the dialogues you will be having with your peers and industry connections. The basic tenants of successful interactions will never change. When shaking hands look into the eyes of the person, you are meeting as a show of respect and interest. Smile. Studies show that 48% of adults think the smile is the most memorable feature after they meet someone for the first time. People are more likely to do business with someone they find responsive when they meet. Don’t make it about you. People generally love to talk about themselves, so ask about the other person’s business, and let them know that their input is valued. The old saying goes, “You never get a second chance to make a first impression.” Don’t waste these opportunities. There is no worse feeling than having a great conversation with someone and then realizing that you don’t have contact info to give the other person. When that person reaches into their pocket or purse and pulls out a business card and yours are back in the hotel room, you will probably break into a cold sweat and stammer as you attempt to think of a good excuse for being ill-prepared. Carry your cards everywhere. Breakfast, lunch, dinner, after hours receptions—everywhere. Embalming fluid suppliers are the heart of the mortuary business. If you run into any complications while preparing a body, the last thing you want to do is rely on a customer support number for help. If you have a good rep with your fluid provider, you should have their cell phone number. In most instances, they will gladly answer your call to help you walk through a complication. If you have a casket supplier that you are close with, they can help you shorten turnaround times and make miracles happen when you have an unforeseen circumstance. It’s not just about building rapport with clients and other directors. Communication is key in every relationship you build in the mortuary business. So now that we’ve given you some steps to take for interpersonal communication let’s talk about integrating digital communication with your verbal communication. If you are just getting started in the business, there is nothing wrong with sending out some email communication to introduce yourself to potential industry connections. Just like your business cards, make sure that your email has all your contact information, so your connection can reach you. You still might want to follow up with a phone call after the digital introduction to give that formal touch. Do you really want to impress? Try an old-fashioned handwritten note to introduce yourself. This type of correspondence is a rarity nowadays. You will really make an impression if you send a note via snail mail. Social media is a great way to connect, especially on LinkedIn. This platform is a great network to meet other professionals who can point you to resources you might find useful. Facebook has some groups that are designed specifically for mortuary professionals, but they can be selective. You might have to build face to face rapport to be accepted into these groups. The key to communication in the mortuary industry is no different from any other business: Be humble and be friendly. People are likely to build and develop relationships with those who they find inviting and responsive. Be diligent in your follow-up and warm in your conversations and you’ll have no problem breaking into the mortuary and funeral service industry. We would love to include you in our network.National Mortuary Shipping & Cremation can help you with all aspects of funeral arrangements in the U.S. and internationally. Contact us today and let us know how we can help you expand your business.